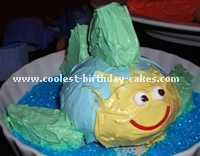 I made this fish shaped cake for my son’s thirrd birthday party. I used a boxed mix to make two 9" round cakes. I cut one of them to make the tail and fins which I "glued" on with frosting. I made the frosting teal by using equal parts of blue and green gel food coloring. I made a darker teal for the piping around the border of the cake. I cut gummy lifesavers into thirds to make the scales. 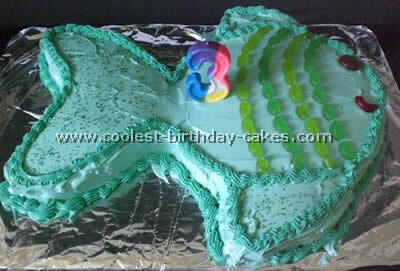 It was a hit at the party and thanks to this site for many fish birthday cake ideas. After the cake was baked I cut it into the shape that I wanted and covered it with a crumb coat. Once it set I started with the fade. I used a green on the top and white on the bottom. I did long strokes starting at the front and moving back and working from top to bottom. This gave it the cake a cool effect. After I had the icing on I did the details of the fins with straight fan pattern. On the face I did the gills with a decorating knife and then did the eye. After all the detailed work was done I did the scales by pressing a tiny "U" shape in a brick pattern to give it the effect of real scales. 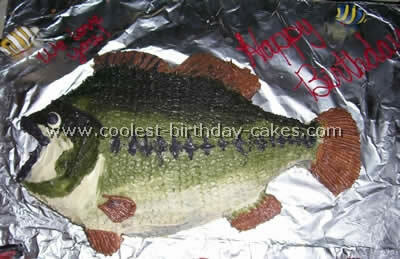 My dad is an avid fisherman so has many fish birthday cake ideas. He thought this cake was great. He even showed the picture off to friends. He loved it! These fish cakes were for my daughter’s first birthday. I wanted a cake that I could make in two sizes so I would have one to serve guests and one to give my daughter for those entire important first-birthday photos! 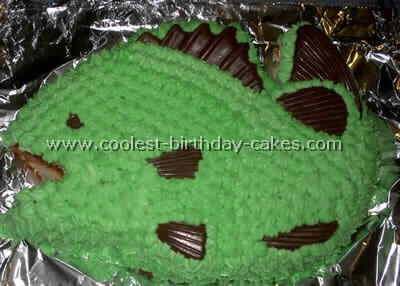 I got lots of fish birthday cake ideas from this site. 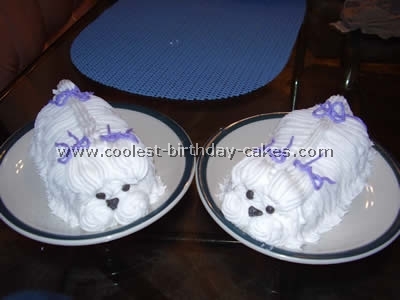 I used a boxed cake and store-bought frosting for these cakes. For each fish I cooked one cake in a small mixing bowl which I turned upside down for the body and a second cake in an 8” round. The round I cut into a thin crescent, for the tail a smaller crescent from the remainder which I cut in half for the two side fins and then cut a triangle out of what was left for the top fin. I held them to the body using toothpicks. I colored the frosting using food coloring and made sure the cakes were well-chilled so they didn’t crumble. I frosted the body first and then frosted as much of each fin/tail as I could before placing on the cake. I touched up the frosting as needed after assembly. I used mini marshmallows and mini chocolate chips for the eyes and string licorice for the mouth. On the large fish I used slivered almonds to create the scales. I placed each fish on a white serving platter and sprinkled blue decorating sugar for the water. I did all this the night before a 10am birthday party and the cakes held up beautifully! 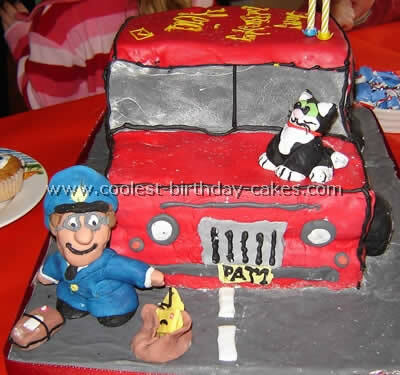 I made this cake for my three year old son’s birthday. 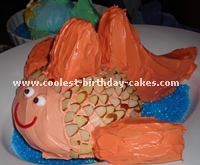 I got my fish birthday cakes ideas from this website. I used a "basic cake" recipe and filled my pantastic fish pan. After I removed the cake from the pan I froze it. I melted chocolate for the fins and tail. After it was frozen solid (overnight) I cut out the small area between the lips and the area between the curves of his tail. I mixed up the buttercream icing with green gel food coloring. I don’t like to spread icing so I used my star tip and decorated it. Then I put the fins and tail in place. P.S. After the pictures were taken I put a lighter colored green frosting in his mouth. My whole family thought it was very good considering it was my first.